BANGI 8 August, 2010 – The Malaysian and International Research Institute (IKMAS) of UKM has been given recognition when its various publications and research had been used as the main source of reference when formulating government policies. 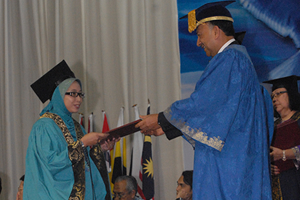 UKM Vice Chancellor, Prof Tan Sri Sharifah Hapsah Syed Hasan Shahabudin in her speech at the second day of the convocation said IKMAS continues to make a name for itself as a source of reference when national development policies are formulated. 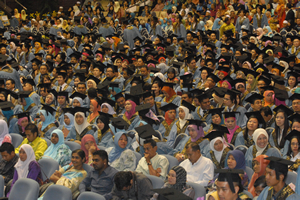 A total of 890 students from the Faculty of Economics and Business (FEP), UKM-Graduate School of Business (UKM-GSB) and IKMAS received their Masters and Bachelor Degrees today at the third session of the University’s 38th Convocation. The session of was Chaired by the Pro Chancellor Tunku Laxamana Tunku Dato Seri Utama Naquiyudin Ibni Almahrhum Tuanku Ja’afar. Sophia Marie Chung Suet Wan who obtained her Bachelors in Accountancy received the Royal Education award. Prof Tan Sri Sharifah Hapsah said UKM places great importance in developing a well rounded student through its various programmes including industrial training, overseas university attachments and co curriculum activities. The UKM Faculty of Economy and Business now has more than 200 international students and has been actively promoting UKM internationally. UKM also has a student exchange programme through its ‘Mobility partnership programme’ which exposes foreign and selected UKM students to sustainable rain forest management and the indigenous community. She alluded to the recent Mobility student partnership programme which brought 78 participants from 11 countries to be exposed to sustainable tropical heritage. The UKM–GSB as one of the Top Business Schools received an increasing number of applications and efforts were being intensified to meet the demands. It is collaborating with various world renowned universities to provide the latest programmes. It has also received recognition by attracting grants from International Shariah Research Academy, Bank Negara, she said. In the evening session, another 1022 graduates received their degrees including eight receiving their Masters Degree in Corruption from The Social Sciences and Humanities (FSSK). Prof Sharifah Hapsah also said that Internationalisation programmes was being strengthened by cooperating with various overseas programmes. Short courses were also being initiated to widen the learning experience of local students and attract students worldwide. 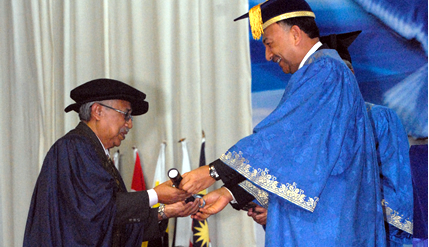 At the ceremony Professor Dato’ Dr Nik Hassan Shuhaimi Nik Abdul Rahman was conferred as Professor Emeritus. 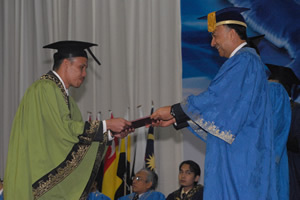 Born in Kota Bharu he received his Bachelors Degree in Social Sciences from University Malaya in 1972, his masters and Doctorate in Archaeology from University of London in 1976 and 1984. He started his Academic career in UKM as a tutor and was promoted to lecturer in 1976 in the History Department and was later promoted to Associate Professor in 1985 and Prof of Archaeology in 1993. He has since received numerous recognition for his contributions and involvement in professional bodies and community service. Prof Dato Nik Hassan is a renowned expert in the field of archaeology in South-East Asia and he has written extensively on the subject.